The East India Company was interested in securing all the major arteries of communication between Britain and India, China and the Spice Islands. Before the Suez Canal was constructed, the main ship route was around the Cape of Good Hope. However for messages, it was still quicker to use either the Red Sea or the Arabic (Persian) Gulf. You would have disembark, travel overland and then reembark onto a ship - but it could save vital weeks over the long journey around Africa. The East India Company was therefore interested in a presence in the Gulf region. It was also interested in the idea of trading with the Persian Empire itself - which was still a formidably wealthy empire in the Eighteenth Century. Bushire was therefore the perfect base to watch communications and develop trade with the Persians. They formally set up a residency there in 1763. Piracy was a severe problem throughout the Gulf region and the East India Company's patience with pirates was tested frequently. Eventually in 1820 their patience snapped and they despatched a military expedition from India to raid the Trucial Coast States (opposite Bushire) and abolish slavery and piracy throughout the Gulf region. The Royal Navy was to be the guarantor of this treaty and would use Bushire as one of their main base of operations to police the agreement. 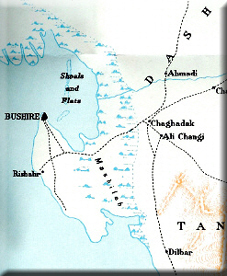 Bushire was actually occupied by the British in 1856 - 1857 as a result of the Anglo-Persian war over the ownership of Herat to the East of Persia. The British-Indian Naval squadron, commanded by Commodore Young, bombarded Bushire which surrendered. An Army expeditionary force, under Major General Sir James Outram, advanced on Brazjun, capturing and destroying many stores en route. 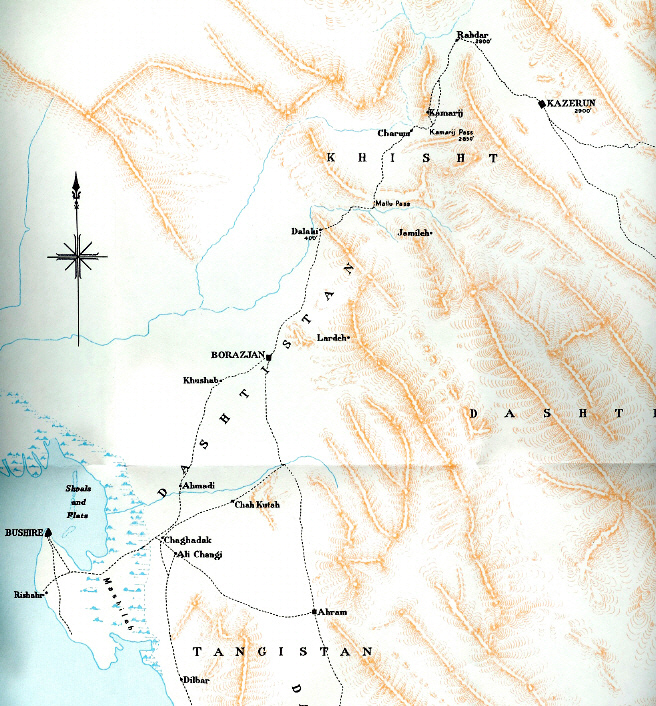 During the withdrawal the British force was attacked at Kooshab, on 7 February 1857, but managed to inflict a heavy defeat on the attacking Persian forces. Outram left Bushire with a garrison while he crossed the Persian Gulf to the river Euphrates and fought a number of engagements before the Persians submitted to the British demands. This allowed the British garrison to withddraw. As well as a commerical hub Bushire was also to become quite a telecommunications hub with a submarine telegraph line linking it to Muscat and beyond. Things were relatively quiet until World War One when Persian resentment of the power of the British was successfully tapped by the German Consul official Wilhelm Wassmuss. He managed to foment a number of Persian tribes to rise up and attack the British with promises of German economic and military support. The British were compelled to send another garrison to Bushire and waste valuable military resources fighting tribes which believed Wassmuss' promises of support. In the end the support was not forthcoming and Wassmuss' energetic attempts were ultimately fruitless. In World War Two Bushire never achieved the important strategic importance that it might have done. However it was still relevant enough due to the growing dependence upon oil from the region. Britain and the Soviet Union agreed on spheres of influence within Persia. It was agreed that Britain's sphere would be in the South - including Bushire. With the indepedence of India in 1947, Bushire lost much of its reason d'etre. A permament residency in the port of Bushire was no longer required. Aircraft could fly diplomats directly to Tehran with ease. Therefore in 1948 the Bushire residency was closed down.